Social Tees Animal Rescue hasn't added a story. PLEASE DONATE TO SAVE THIS PUPPY & MORE!!! We are back on the ground in Los Angeles, and this rescue mission is exceptionally urgent — so many forces seem to be working against the animals at risk here at once, and we need YOU in order to help ensure that even some of them survive. You all know of the fire devastation, and it’s taken a huge toll on pets both wanted and already forsaken. One animal control location was evacuated, and pop up centers were hastily constructed to try to manage the tidal wave of abandoned dogs and cats (and others) as neighborhoods were ravaged and people forced from their homes. Our west coast rescue partner was evacuated and has been camped out in an empty storefront with community help, scrambling to care for their own dogs while they help us try to figure out how to rescue more. This puppy and one littermate are only 5 weeks old, and they were just dumped with one of our partners — the individual who left them explained that their former owner is suffering from severe drug addiction and neglected the puppies and their mother to the point that the mother and three other puppies in the litter died of starvation. Our partner is already completely overwhelmed with dogs abandoned by the fires and doesn’t have the capacity to take this baby in, but we cannot turn him away. WE NEED YOUR HELP!!!! The city has a daunting path of recovery ahead, and we are trying to do our small part by taking in dogs from our partners and from overloaded kill shelters to make room for the incoming dogs that have been rendered lost and/or homeless because of the disaster (which will give their owners a chance to find them). This time of year is always heartbreaking because animal abandonment rates often rise before holidays/vacations and fewer people adopt in an effort to wait until they are back from travel to bring in new family members, so cages pile up. Because of the fires, even fewer are adopting, and already strapped rescue groups are unable to take in as many animals as they otherwise would. PLEASE HELP!!! Our goal is to save at least 25 dogs by the end of this week — we need to secure their vet care pre- and post- travel, flights (sadly the fees are rising! ), ground transportation, and more. It may sound like a drop in the bucket, but every life counts. The time of year shouldn’t matter when an innocent soul is on the line, but we can’t help but urge you to please, please make it possible for these animals to find foster or forever homes — or simply be alive on this earth — for the holidays. Social Tees Animal Rescue hasn't posted any updates yet. 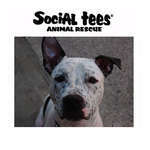 Social Tees Animal Rescue is managing the funds for this campaign.